The vegan version of the classic white sauce, this can be used as the basis of a creamy vegetable sauce. It’s also good in a pie filling with ingredients such as spinach or mushrooms. For a cheese-style sauce, stir in 125 g (4 oz) cheddar-style vegan “cheese” after the sauce has thickened. Melt the butter in a saucepan, then stir in the flour and cook over low heat for 2 minutes, stirring constantly. Slowly add the soya milk, increase the heat slightly and bring to the boil, stirring until the sauce thickens. 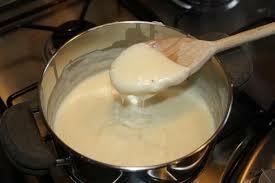 Using a medium saucepan, add in the cream sauce over medium-high heat. Stir/whisk for 5 – 10 minutes until it is thickened to your liking. Good way of explaining, and pleasant article to get data concerning my presentation topic, which i am going to convey in academy.